Denman produced a mighty performance to land the eagerly-awaited totesport Cheltenham Gold Cup on the final day of the Festival meeting. Master Minded put in a simply breathtaking performance under Ruby Walsh to win the Queen Mother Champion Chase from Voy Por Ustedes and Fair Along. Katchit put up an immensely gutsy display to land a famous victory in the Smurfit Kappa Champion Hurdle, the feature race on the opening day of the Cheltenham Festival. Inglis Drever made Cheltenham Festival history with a record third success in the Ladbrokes World Hurdle. Celestial Halo proved too strong for the hotly-fancied Franchoek in the JCB Triumph Hurdle at Cheltenham. Fiveforthree showed real determination to land the Ballymore Properties Novices' Hurdle at Cheltenham for Willie Mullins and Ruby Walsh. First-time blinkers worked the oracle for Our Vic in the Ryanair Chase at Cheltenham. Tony McCoy rode his first winner since returning from a serious back injury when Albertas Run landed the Royal & SunAlliance Chase at Cheltenham. Tidal Bay put up an impressive display to run away with the Irish Independent Arkle Challenge Trophy at the Cheltenham Festival. Owner JP McManus dominated the opening race of the Cheltenham Festival, the Anglo Irish Bank Supreme Novices' Hurdle, with a one-two from Captain Cee Bee and Binocular. Punters face two bumper days of action following the abandonment of day two of the Cheltenham Festival. Philip Hobbs bids for a second victory in Wednesday’s Grade One Seasons Holidays Queen Mother Champion Chase with Fair Along. Sky Bet is launching the Sky Bet Cheltenham Club, which brings amazing offers and concessions to all Sky Bet Customers over the four days of the Cheltenham Festival - Tuesday, March 11 through to Friday, March 14. 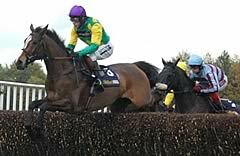 Kicking King, winner of the 2005 Cheltenham Gold Cup, has been ruled out of the 2008 renewal next week. Cheltenham Racecourse today announced the six names that form the shortlist for its award recognising “the outstanding contribution made by a lady to Jump Racing". Ex-Irish pointer Denman has been a revelation since the very first time he appeared in public at Liscarroll in his only point-to-point start. The Weatherbys Champion Bumper on Wednesday, March 12, is likely to see the first ever runner owned by the Queen run at The Festival, in the shape of the Nicky Henderson-trained Gold Award, who has won both his previous starts at Fakenham and Ascot. Entries for the final four of the 25 contests to close at The Festival 2008 are revealed today, including the new Grade Two David Nicholson Mares Hurdle, run on Friday, March 14. Betting interest in The Festival’s ultra-competitive handicaps looks set to step up a gear today following the publication of the weights for the 10 contests at a special event at Cheltenham Racecourse. The Festival’s six Grade One novice events all promise to be races to savour following the February 19 forfeit stage, details of which are revealed today. Few things are more coveted by trainers than a victory at The Festival at Cheltenham and no current handler has enjoyed more success than Nicky Henderson, who despite failing to score in 2007, can boast 31 winners at jump racing’s premier event. Having trained his first winner at The Festival in his first season as a licence holder last year, David Pipe looks set to increase his record this year, with a strong team preparing to travel up to Prestbury Park next month. Champion Tony McCoy, with 19 wins to date, is the most successful current jockey at The Festival. Irish jockey Andrew McNamara first hit the headlines when steering Newmill to a nine-length success in the Seasons Holidays Queen Mother Champion Chase at The Festival in 2006. Entries are revealed today, Thursday, January 31, for the four Grade One novice hurdles at The Festival – the Anglo Irish Bank Supreme Novices’ Hurdle, the Ballymore Properties Novices’ Hurdle, the JCB Triumph Hurdle and the Albert Bartlett Novices’ Hurdle, which is being run as a Grade One contest for the first time in 2008. Cheltenham Racecourse is to rename the 2008 running of the National Hunt Chase at The Festival in honour of Sir Peter O’Sullevan, master commentator, journalist, racehorse owner and charity fund-raiser, who shortly celebrates his 90th birthday. Vale of Glamorgan trainer Evan Williams is aiming his totesport Gold Cup hope State Of Play at the £100,000 Grade Two Letheby & Christopher Chase on Festival Trials Day at Cheltenham on Saturday, January 26. Trainer Alan King reports his top staying hurdler Blazing Bailey to be in “good form” ahead of the six-year-old’s attempt to score a repeat victory in the £60,000 Grade Two Byrne Group Cleeve Hurdle (3.50pm) over three miles at Cheltenham’s Festival Trials Day on Saturday, January 26. William Hill have opened betting on this years Weatherbys Champion Bumper at the Cheltenham Festival. Cheltenham this week announced that Ryanair, the world’s largest scheduled airline and official airline of The Festival, has agreed to extend its sponsorship of the newly promoted Grade One Ryanair Chase for a further five years to 2012. Cheltenham Racecourse is delighted to announce that Jacqui O'Neill, one of the most high-profile women in Jump racing, has agreed to become its Ladies Day Ambassador for 2007/08. Owners with runners at Cheltenham during the 2007/2008 season will enjoy an enhanced experience thanks to a new link-up between the racecourse and Irish Thoroughbred Marketing. Cheltenham today revealed full details of its new season, highlighting the news that prize money offered at the home of Jump racing in 2007/08 is a new record of £5.9 million. Last season's equivalent figure was just under £5.5 million. Cheltenham Racecourse announces that Brit Insurance is withdrawing from sponsorship of the three-mile novices' hurdle Pattern that concludes at The Festival after three years. Cheltenham Racecourse today announced that The Festival, due to be held from March 11 to 14 in 2008, will remain a four-day meeting. War Of Attrition, trained by Mouse Morris, owned by Ryanair tycoon Michael O'Leary and ridden by Wexford jockey Conor O'Dwyer, stormed home in some style. For four extraordinary days in the middle of March the National Hunt racing community from all around the world converges on the elegant spa town of Cheltenham. The twenty races are the most hotly contested of the entire racing calendar with more than £2 million in prize money and £20 million in bets riding on these Championships. In the Gold Cup's history only six horses have won more than once, and the most recent of them is Best Mate in 2002, 2003 and 2004. The others were L'Escargot (1970/71) Easter Hero (1929/30), Golden Miller (1932/33/34/35/36), Cottage Rake (1948/49/50) and Arkle (1964/65/66). Their successes were all in consecutive years.